Here’s a health to an Accepted MASON. As a Free and an Accepted MASON? Constitutions, James Anderson. London : 1723, p. 84. A new verse was inserted after verse V in Benjamin Franklin's 1734 printing, p. 90: "VI. 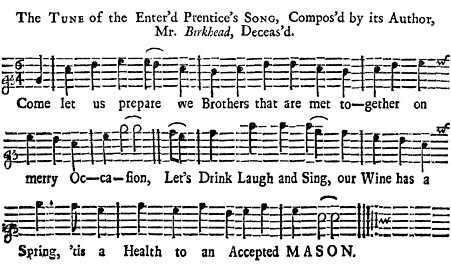 / We’re true and sincere / And just to the Fair ; / They’ll trust us on any occasion : / No Mortal can more,/ The Ladies adore, / Than a Free and an Accepted Mason."